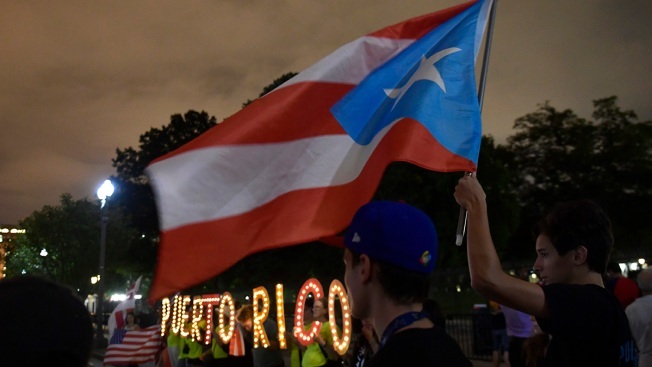 FILE - People gather outside the White House in Washington on Sept. 20, 2018, during a vigil commemorating the one-year anniversary of Hurricane Maria hitting Puerto Rico. The U.S. government announced Monday that it will begin to publish economic data on Puerto Rico amid concerns that statistics released by the U.S. territory itself are flawed. The Bureau of Economic Analysis said it will analyze consumer spending, business investment and trade in goods from 2012 through 2017, as well as in the future. The agency said the data will be published later this year, and that its work could eventually lead to an estimate of Puerto Rico's gross domestic product. "For years, Puerto Rico has produced its own estimate of economic activity," the agency said. "The island, however, suffered devastating damage in 2017 from Hurricane Maria, exacerbating its financial troubles." The U.S. government has pledged billions of dollars for such efforts, but the territorial government's plan to merge its Institute of Statistics with another agency led to accusations that the government was trying to manipulate economic data as it struggles to attract investment amid a 12-year recession. The Bureau of Economic Analysis already publishes GDP and other statistics for U.S. territories including Guam, American Samoa and the U.S. Virgin Islands.